We have put together a list of the best milk frother on the market. A coffee is part of our daily life and more importantly it`s a part of our daily morning routine. Most of the time we have only a few minutes every day to enjoy a good cup of coffee, sit back and relax. The best of a good cappuccino or caffè latte (in Europe called latte macchiato) is the frothy topping. So you wouldn`t want to froth milk with just any milk frother. Your coffee break deserves better. However, finding the best milk frother can be a challenge, so we have done all you need. Coffee and all related variations like latte and cappuccino getting more and more popular. Creating these wonderful drinks at home is a wish for many people. One tool besides the coffee or espresso machine is a milk frother. Milk frothers are used to make nice fluffy foam for a perfect topping. The most common models are electric, manual and wand frothers. Aside from just being pretty cool, there are a lot of benefits using this type of household item. You are much, much closer to a coffee shop milk froth. Hot frothy milk with a touch of a button! It’s simple. Not into froth? You can still have nice thick steamed milk for any milk-based drink like hot chocolate. Did I mentioned it`s just cool? Really, when you offer your guests a decent cappuccino with a nice milk froth, you`ll look like a total professional!! How do I find the Best Milk Frother for me? When you’re shopping for a milk frother, there are a number of factors you should consider. Style and handling. The more luxury milk frothers are electric and consist several parts: a pot with handle (sometimes removable) as well as a base with a button. Classic style of milk frother are called ‘wand frother’ which have a handle with a button and a small whisk. And there are manual milk frothers which work like a French coffee press. Just put hot milk in and pump. Cleaning. The cleaning ability doesn’t directly affect its performance, but it does affect your comfort level. Generally, you don’t want to spend much time on cleaning your milk frother; instead you want to let frother do most of the work. This can be a bit easier with an expensive frothers. At the end of the day, it’s up to your personal preference. Manual or electric. With manual milk frother, you need to heat the milk first in the microwave or in a pot and then froth it – these are two tasks and can take a few minutes. An electric milk frother is doing everything for you – just pour milk in, push a button and wait it until the milk is warm or frothed. Foam softeness. A cheap manual frother cannot deliver the same consistency of foam as an electric milk frother. Generally, a frothing wand creates froth full of air which is not as the stiff foam from an electric milk frother. Any of the following milk frothers would be a great buy and an useful addition to your coffee break. Much of it comes down to personal preference. It`s like with any product, you can get some really nice milk frothers when you’re willing to spend a bit of cash, but there really are great products in every price range. The Kuissential Automatic Milk Frother is one of the best milk frothers you can get for under 50$. This thing is great and looks good. The stainless steel exterior is basically like a mirror. The handle of the jug is pretty unique, too: it looks like an industrial style and is very modern-looking in your kitchen. It’s a 4-piece milk frother: It has a transparent lid, a silicon ring, a jug and a detachable power base with a cord that has a nice length. The best thing is the non-stick coating inside the jug so it is very easy to clean. At the side the jug has a on/pause button and an indicator light so you can just can do other things until it is finished. The milk frother comes also with 3 whisks which is really like two in one – one is for frothing milk and the second is for heating & mixing milk for delicious hot chocolate or milk shakes. How great is that? The Kuissential milk frother is a truly good add-on for your home made coffee. However, the frothed milk is like in your favourite coffee shop. This is partly because of its great functionality. It’s not heavy and easy to use, it should definitely be on your wish list. The only disadvantage is that stainless steel gets a bit dirty after extended use: it’s used every day after all. If you’re interested in this product, and you want to keep it looking good, it might be worth investing in simple polishing cloth. This milk frother heats about 1 cup (8.5oz./250 ml.) of milk at a time perfect for a good cup of coffee. Inside the jug you have level indicators to show where to fill up the milk as it doubles in volume as you heat it. This 3-piece frother can easily be taken apart to clean it. The jug sits on the base and you only plug in the base. While some manual frothers take some time to prepare a perfect cream here it is just on button that does it all. The blue LED shows that it is in action – its silent running and the LED flashes when it’s ready. So you have more time to chat or prepare your coffee and don`t start to sweat doing it all manually. Check out some great reviews on Amazon. The inside material is special as it has a non-stick finish. Just rinse it and take a paper towel to clean – we think this is really cool and saves lots of time. All-in-all, this is a very good option in the mid price range, and perfect for all ages. The Nespresso Aeroccino is different from the other electric milk frothers. Nestle Nespresso is a Swiss company based in Zurich offering luxury coffee products and machines. There are only a few big companies in this market, and Nespresso is one of the big players known for it`s high quality. The first thing you notice is the amazing colors which look great on every counter. The jug has also a wave design and therefor offers a lot of grip to hold as the handle is missing. Why is the handle missing you think? Well why not! We think it`s a good idea and something to set this frother apart from all the others on the market. Cleaning is very easy due to the non-stick inside. It comes with two whisks to make some hot & cold froth or just to heat milk for hot chocolate. Just push the button and wait until the light is on to get some great milk froth; Really, we think it`s better than in the most coffee shops. It is a luxury milk frother and with a very unique design, that’s why it costs a bit more than the others. But if you love fantastic colors and Swiss high-end quality the Aeroccino could be the right for you. The following manual best milk frothers are a great deal and good if you want to prepare some fluffy cream in a few minutes. You can create the frothing effect even with any milk, because it is simply adding air to the liquid. Before you start just fill the jar with milk and move the plunger few times fast up and down. These frothers don`t require electricity, so you have it literally in your own hands how your milk froth turns out to be. As a yummy cappuccino is only complete with a perfect topping, these frothers are the ones you should consider when buying a manual milk frother. The Bodum Chambord Milk Frother has an excellent look. It is designed by Bodum, a kitchenware company founded in Denmark and now based in Switzerland. As you might know, products from Switzerland have a great quality and for under 50$ this is an excellent deal. The Chambord just looks elegant. The combination of stainless steel and glass would fit in any kitchen without a doubt. The handle is made out of glass and has a smooth touch, but still has a great grip. The jar is made out of borosilicate glass which will not interfere with taste and can resist high temperatures, so heating your froth in the microwave for 30seconds after frothing is no big deal. If you fill up your frother with milk you will have no problem as the milk fill line is clearly marked on the outside with a black line stating “maximum” in different languages; Really, how cool is that – easy to use for all your family and friends. After you have served your guests, you can put every part of the Bodum Chambord milk frother into the dishwasher – so we think this is great for every coffee break. This HIC Stainless Steel Milk Frother made it easily to our top 3 reviews. With 14-ounce capacity this is enough to serve several coffees – this is amazing and lets you serve amazing tasting lattes, chai teas and so much more. The price is just right for under 20$, there is nothing that could prevent you from buying this perfect addition to your kitchen. Stainless steel as material is great for every household item. It doesn`t interfere with other tastes and you can simply rinse the frother or put it in a dishwasher – it keeps the same quality. Just put milk in the jar, the lid on and push several times to make your own soft and fluffy froth. It takes only 30-60 seconds and you`re done. That`s so much faster than going for a run to the next coffee shop. We think it`s definitely worth to buy a good milk frother – so why not this one, your kids will also like a nice hot chocolate with some quality froth. The Nopro Glass Froth Master is great to make milk froth for every occasion and drink. The jar is made of durable tempered glass and has a marked fill line on the outside. The jar holds up to 16oz (2 cups), that`s a lot of great tasting milk froth for coffee and milkshakes. Just put milk in and push for 20-30 seconds. You will instantly see how the liquid turns into froth; That’s really nice, so you can create your preferred consistence. Cleaning is easy; Wash it by hand to not break the glass when exposed to the extreme temperatures that a dishwasher can expose it to. To froth it, just put the lid on and push the stirring stick fast up and down until it is frothed your way. The following Wand Frothers are a must-have for coffee lovers. If you want to have soft milk froth and not spending much money this is the one you should get. You just put some batteries in the frother and off you go. The cleaning is for all wand frothers the same; We recommend cleaning after each use by rinsing only the whisk under running water or in a cup of water. But please, don`t put it in the dishwasher! The Kuissential SlickFroth 2.0 is an electric frother that turns your milk into delicious foam that gets you right to Rom, Italy. Homemade coffee creations are just the best as you know exactly which ingredients you used. The stem out of stainless steel and the handle is made of plastic which allows a good grip. To create the perfect foam with the SlickFroth take a high cup and fill it to 1/3 with hot or cold milk. Now put only the whisking head into the liquid without dipping the plastic body. Hold the milk frother at a slight angle and turn it on. The milk will start to froth now. Raise and lower the frother a few times so the whole milk froths – top and bottom. Turn the frother off, when you thinks it`s done. Replacing the batteries is easy; Just slide off the on/off switch this allows you to insert batteries through there. You don`t need unscrew anything. This wand frother is available for under 20$; Really, what are you waiting for? Go and get it and turn your plain coffee or hot chocolate into a 5-star drink! The handheld Aerolatte Milk Frother works perfect to froth hot and cold milk. The elegant design looks stylish, today and tomorrow. The stem and whisk are made of stainless steel, fitting perfectly to the silver handle. 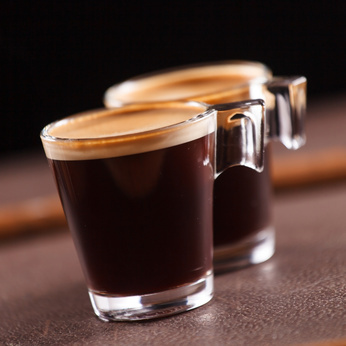 Coffee lovers around the world are keen to create the perfect foam. With this frother you are a step closer to that goal. The fast motor turns milk fast into excellent milk froth; And it only needs two AA batteries to work. The small size is excellent for putting the Aerolatte into a drawer. We have heard that lots of people take their Nespresso Machine on vacation, so why not this little gem to create the best topping for your favourite drink? For under 20$ on Amazon this is a great deal. The Ikea Milk Frother is a convenient handheld frother for everyone. For under 10$ this is the best deal you can get for a frother. This handheld milk frother is just fun and easy to use. The chrome style and black button to switch it on fit perfectly together. Just hold the whiskhead below the foam level to make an amazing froth. The shape of the silver matt handle with the smooth sides is great. Replacing the batteries after some time of good frothing is simple; a black cover slides off to reveal the battery chamber. We think this is a great choice in the low-cost range.